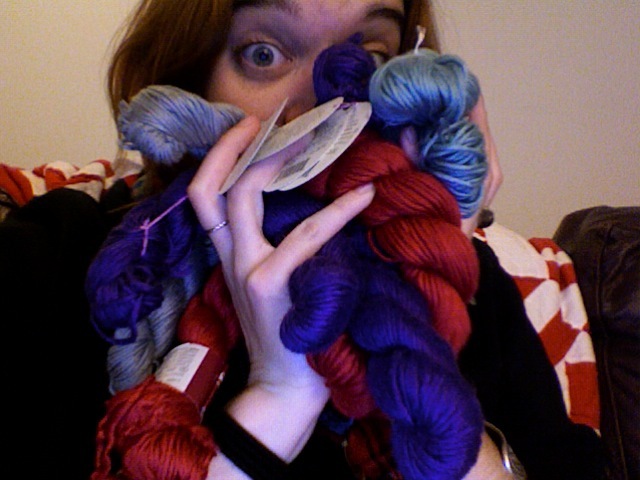 I just bought a bunch of yarn from Nangellini for some Christmas presents…. yay!!! I just love this yarn. 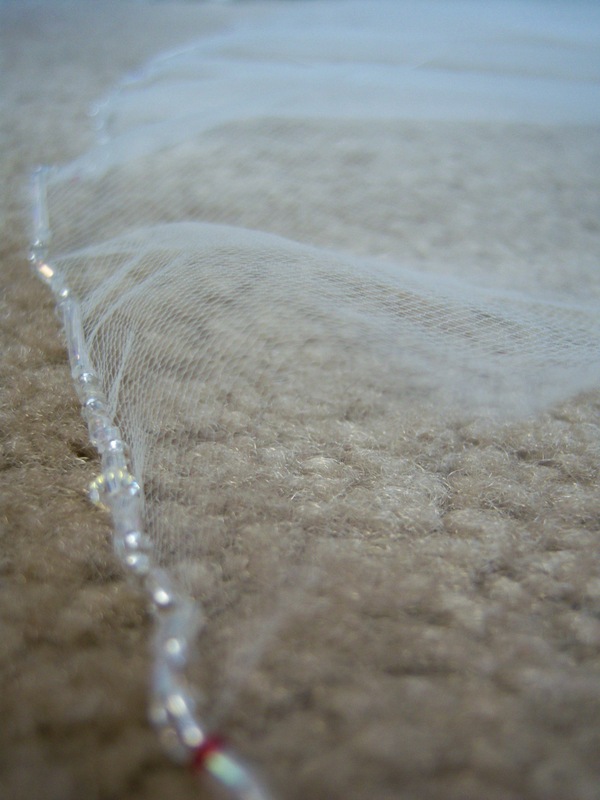 Its Ella Rae bamboo silk, and it is softer than anything. I even love balling this yarn up, its so soft and nice. 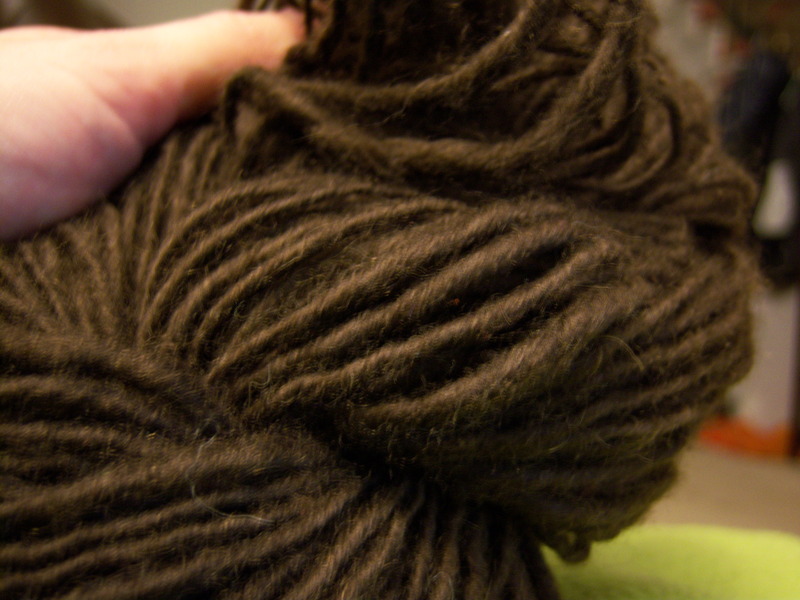 Here’s the yarn I spun up a few nights ago… its currently drying in the kitchen. I can’t wait to knit it into my blanket. Its a really pretty green color (a bit darker than this photo). I’m working at spinning up all the roving currently sitting in my room, it takes up much space, and I really should use what I have before getting more… This is a pretty thick yarn, but mostly the same weight all over, which I’m proud of. I’ll have to knit it big and loopy….. The Amy Butler bag is perfect for carrying my blanket! Its getting bigger and bigger…. I’ve started knitting directly onto the blanket instead of making squares and attaching them later. I’m still trying to get a good shot of the whole thing (and a better shot of the bag in action, perhaps down at Ultimo…) so I’ll post more pictures soon. I’m proud of all the hand spun I’ve been incorporating. (That blue and white bit poking out is hand spun, as is the variegated blue towards the bottom edge of the bag). I rarely have enough attention span to spin a whole bunch of yarn, so this gives me a great way to use up the odd ends. Perhaps I’ll set the yarn I spun a few days ago and add it in, its nice squishy merino, various shades of greens and blues (roving from Alexis, she gave it to me with my drop spindle). I also have some brown spun up (from roving that Tina gave me), but I have more roving of the same color, so I might add onto it. Its on a shorter drop spindle thats a little slippery, but its my first true solid color yarn, and I really should finish it! 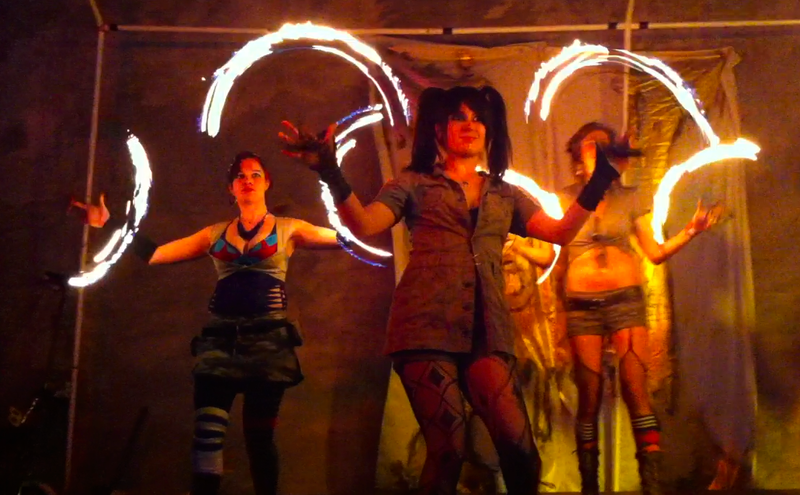 I’ll post some photos of the spinning I’ve been doing after dinner gets thrown in the oven. Finally getting to the beautiful roving Tina gave me. Nice and soft, lovely colors. In the meantime, hop over here to check out the site I threw together for my dance troupe Rag Tag Tribal. Its still under construction, but coming along nicely I think. So far I’m the only one contributing, hopefully some of the other lovely ladies will post every now and then. I’d like to put up a photo gallery, but I’m not sure how to do that on the free wordpress… ah well, I’m sure I can figure a way. Here are some spinning shots, and one of the dinner thats finally in the oven…. yum. Chris brought a whole bunch of fun stuff from his parent’s house this weekend… games, some drawers to replace the ones I have taped up…. and a knitting project- the bottom part of a crazy colored sweater. Looks like something that would have been swell with shoulder pads. :-) I have all the yarn, but not the pattern. I’m not sure what to do with the bit thats already knit… it looks like Fair Isle, which I don’t know how to do. Its a 20 year old WIP… Any suggestions for what to do with the part that is already knit? It seems a shame to frog it. I’m thinking I might make it into a bag or something. The yarn is nice bright colors, all 100% Norweigen wool, according to the label. There were also some buttons. I’m not sure how they would fit with the sweater, but they came with all the yarn. Yay new supplies for my stash!